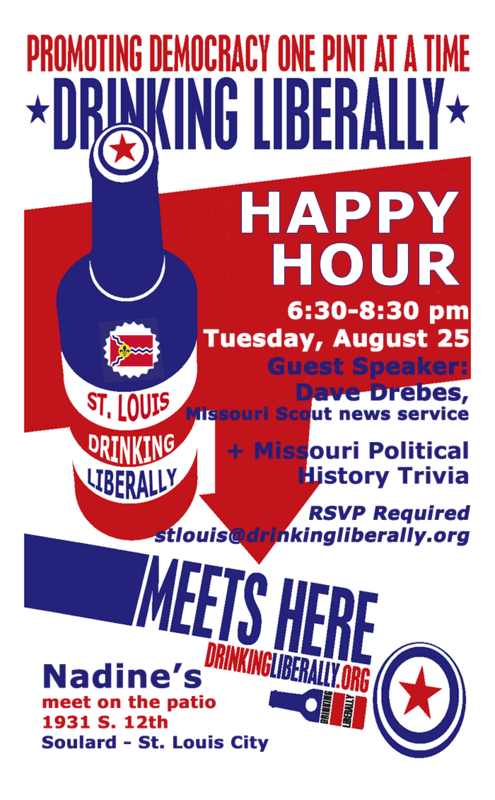 Please RSVP to stlouis@drinkingliberally.org to ensure a seat. In the 1970’s-80’s, there was a small group of legislator-lawyers in the Missouri House known as “The White Hats.” They actually read proposed legislation and amendments. They wrote amendments without the assistance of lobbyists. They asked hard questions and made eloquent speeches for and against proposals. They were data-driven before it was a thing, requiring documentation and not merely anecdote. They were champions for campaign finance reform and curbing conflicts of interest in public office, reproductive rights, child welfare, the poor and elderly, the environment, public education, civil rights, Labor, and the wise spending of public funds. They were Liberals that spoke against legislative pork. They often butted heads with important elected officials and lobbyists. They were heroes to me and others. Then, one day in the early 90’s, some of the remaining White Hats fell off the pedestal we had placed them on. Times had changed. The Missouri House Speaker had consolidated power and was the most important elected official in the State. He ruled with an iron fist. He required votes for his priority bills. Sometimes these priorities were more for the good of a few than the many, bills that needed a legislative moral compass, needed The White Hats. But voting your conscience came to have repercussions. Your district would not get money it needed for a public works project. Campaign money would dry up and the Speaker would find someone to run against you. A relative might coincidently lose a job. The Speaker might allow abortion restrictions to come to a vote in order to secure Republican votes for his priorities. And one by one, I saw The White Hats take to a House floor microphone to say how bad a bill was, walked away holding their noses to demonstrate the legislation stunk, and then they voted Yes. I hate Proposition 1 because it reminds me of the Fall of The White Hats. I hate it because it makes me question my own values and what is and is not in the public’s best interest. I hate it because it forces me to decide if the ends justify the means. 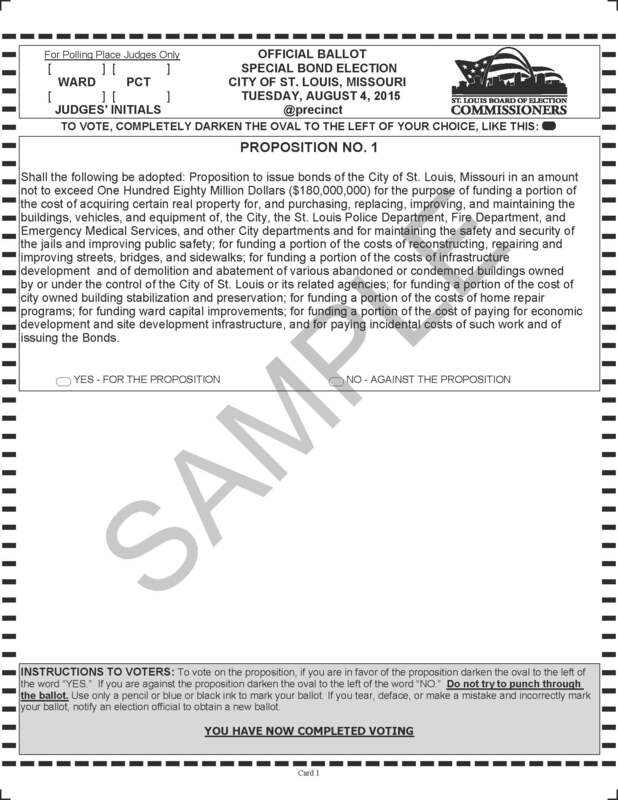 Proposition 1 is a property tax increase to pay for $180 Million in bonds for capital improvements and other things. Vote for Proposition 1 if you are OK with special elections designed to incur the least number of voters deciding the fate of an issue. The City of St. Louis should be encouraging voter registration and voter turnout. Instead, our elected leaders have joined forces to ensure a handful of voters make an important decision. Why? Because they believe that the more voters who turn out, the more likely it will fail. We need a Charter Amendment to move all our City elections to the state elections cycle. No more low turnout Spring elections in the snow and ice, no more special elections except to fill vacancies. It will save money and increase turnout. On the other hand, if poor leadership by Mayor Francis Slay and Board President Lewis Reed have caused us to actually be in a capital improvements crisis, and this is a must have bond issue, then I can see where we might hold our noses and vote for it. But. But, we should also be bouncing both the Mayor and Board President out of office first chance we get for having failed to properly plan. Vote for Proposition 1 if you are OK with Section 6. of the enabling legislation and understand that the money will be spent with the qualification “substantially in accordance with Exhibit A,” the mysterious Exhibit A. Adding further intrigue, several aldermen are under the impression that Exhibit A is actually the March 20, 2014 St. Louis City Capital Improvements Committee’s Needs Report. Good luck finding out who is on that Committee and when it meets. “Substantially in accordance” means that money can be moved around and most assuredly will. Do I believe for a second that the money identified for the Fire Department will not be spent on the Fire Department? No. I have every confidence that fire fighters will either see those funds spent as intended or raise so much hell that recalls of elected officials are the result. Some of the other monies, I have no such confidence. Could funds be used to enhance our long vacant Municipal Courts Building as part of a sales deal, essentially subsidizing redevelopment? Yes. I believe so. Could funds from more than one line item be used for retaining the National Geospatial Intelligence Agency in St. Louis City? Yes. I believe so. Could funds from the Ward Capital Improvement Fund be used to plug a hole in the Budget? Yes. I believe so. And it won’t be the first time. Vote for Proposition 1 if you’re OK with aldermen getting more money for their Ward Accounts. I have no issues with aldermen having a pot of money divided up 28 ways and used for capital improvements within their wards according to how each alderman sees fit. As a 7th Ward resident, I know that my former alderwoman used those funds smartly and as matching funds toward even more neighborhood improvements. But the added funds for aldermen to spend was, let’s face it, a bribe to get their votes to put Proposition 1 on the ballot. My concern here is not the ethics of legislative pork. That train left a long time ago. My concern is how easily aldermen had the rug pulled over them. 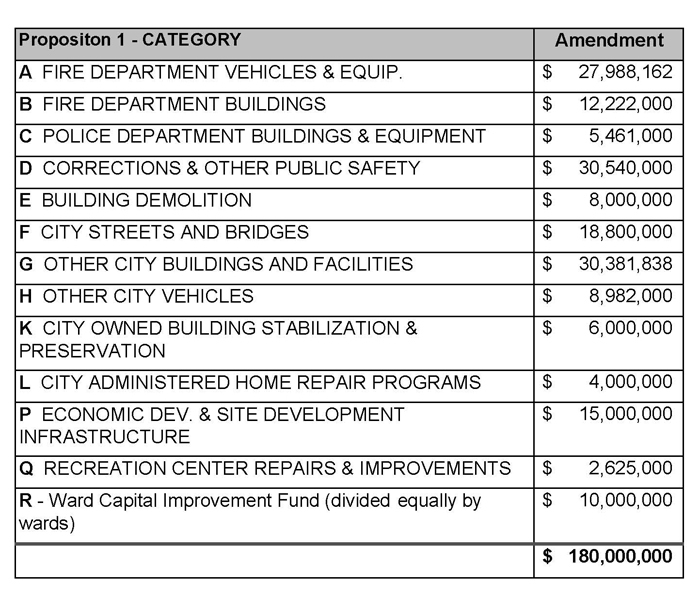 A Budget crisis is coming/here and that new money for the ward accounts will be the first fatality, essentially turning the Ward Capital Improvement Fund into the Emergency Fund. I also know that these ward accounts are part of what some call the “fiefdom” problem and oft ridiculed parochialism in St. Louis City. Funny thing is some of the very corporations funding Proposition 1 want an even stronger mayor system. They want a big pot of money from which the mayor can draw upon to do big things. But they have ponied up and contributed to increased support of the so-called fiefdom system. Vote for Proposition 1 if you do not require transparency from your elected officials. The word “tax” does not appear in Board Bill 2 authorizing the bond issue vote nor in the ballot language you will see at the polls. The word “tax” does not appear in any of the proponent literature. Sure. It’s been done before. But this time it is different. This time, the St. Louis Post-Dispatch has failed to call a tax, a tax. While some news stories have included information on the tax increase that would result in passage of the ballot issue, the headlines speak differently. A tax increase elsewhere is called a tax increase. Tuesday’s ballot issue for a tax increase, however, has only headlined as a bond issue. The number of people who read a news story is much lower than the number of people who read a headline. I am not suggesting a conspiracy here. I am suggesting that in a ballot issue campaign with a well-funded proponent side and no opposition, the daily paper of record failed in its role as public watchdog. I am also suggesting that we need a Charter amendment to require the words “tax” and “increase” be used in both enabling legislation and ballot language for any tax increase. Vote for Proposition 1 if you believe the ends justify the means. I believe that the men and woman of the St. Louis City Fire Department walk on water. They should be paid well, pensioned well, and have everything they believe is required to fight and prevent fires and attend to emergency medical situations. 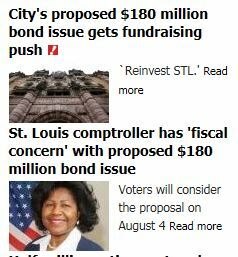 I want to vote for this bond issue so that they get what they need. I really do. The question is, do I turn a blind eye to all the imperfections of this bond issue? Do I hold my nose and vote in the affirmative? That is the question each of us must ask and answer. The 7th Ward Independent Democrats did not meet and vote on an endorsement for this issue. I could not have dragged three members to a meeting in the summer. As committeewoman, I have pledged my endorsements to whatever the members decide. Since there was no vote, I cannot endorse either way. Still, I wanted to provide a forum for the general public to be educated on Proposition 1. Finding pro and con speakers, however, proved impossible. In the end, I thought we’d post pro and con essays on the 7th Ward Blog and call it a day. I asked Alderman Jack Coatar, who voted for the enabling legislation, but he declined. Board President Reed, the bill’s sponsor, did not respond. As I continued to ask elected officials to write in favor of the ballot issue and they were not interested, I grew more frustrated and just gave up on it. Sorry. I tried.